The Allalin 4027 is a nanometer resolution spectroscopy instrument, based on a disruptive technology known as low-temperature quantitative cathodoluminescence that securely integrates a light microscope, a scanning electron microscope, and a cryogenic stage into one tool. It is built for those who need to follow a tight technology roadmap and quickly access very precise spectroscopic information that has been unattainable using traditional methods. In the semiconductor sector, the Allalin 4027’s 1600 color channels offer an unparalleled solution for measurement of energy transfer in second generation solar cells and band-gap energy in gallium nitride based devices such as LEDs and power transistors. It can accelerate technology development process and perform advance failure analysis (Indium clustering, band-gap shifts, etc.). In scientific and industrial research, the Allalin 4027’s ability to create spectroscopic maps with nanometer resolution at varied temperatures makes it the ultimate tool to acquire a deep understanding into the physics of nanoscale objects. 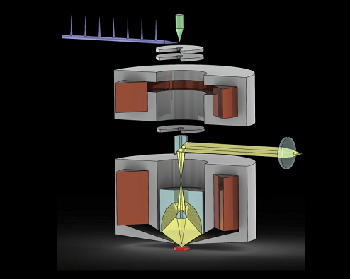 The system was constructed from the ground up to attain greater cathodoluminescence performance without sacrificing the electron microscope performance: the light microscope and the objective lens of the scanning electron microscope are carefully intricated so that their focal planes match each other; the light microscope is machined with sub-micrometer precision so as to reach ideal achromatism, high numerical aperture (N.A. 0.71) and constant and better photon collection efficiency over a field of view of 300 µm, so that quantitative cathodoluminescence benchmarking becomes conceivable for the first time; the electron microscope also works at low electron beam energy (3–10 kV) for improved cathodoluminescence resolution. 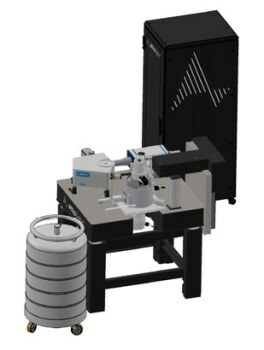 The Allalin 4027 adds a six-degrees-of-freedom cryogenic stage for arbitrary positioning of the specimen with 1 nm increments and zero drift and vibration at low temperature (10–300 K). 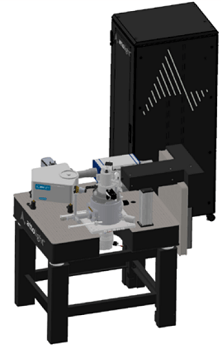 The Allalin 4027 includes a spectrometer, a zero-drift liquid Helium cryostat, a high speed EMCCD camera, a six-degrees-of-freedom nano positioning stage and extra electronic hardware to run fast hyperspectral acquisitions. 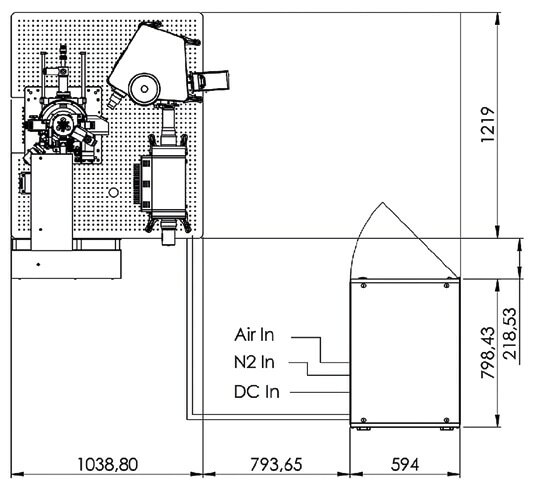 Attolight optical microscope features constant resolution and photon collection efficiency over a field of view of 300 μm (left). Quantitative cathodoluminescence, i.e. comparison of emission intensities between various points is now possible. The traditional parabolic mirror approach is plagued by blur and vignetting (right). Mapping of the QDs location with respect to the emitted wavelength. Blue, green and red correspond to 3 wavelengths between 650 and 700 nm. Some dots emit at several wavelength, resulting in composite colors (e.g. yellow). Hyperspectral mapping of different layers in a cross section of a GaN/AlGaN hetero structure. 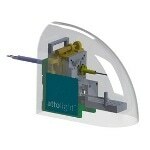 The Attolight CL Tool sits on an optical breadboard mounted on four isolator posts to attain vibration isolation. A typical recommended layout is shown below.